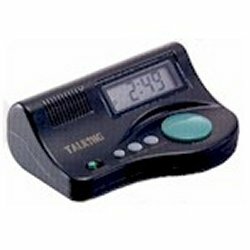 This talking clock features a smooth, curved design and large LCD display. Simply press the large, user-friendly button to find out the time. A very clear female voice charmingly announces the time. Other features include an alarm to wake up to the sound of a rooster, hourly time announcement and volume control.